24 years ago a number of Norman’s business leaders determined that the city of Norman needed to provide opportunities for like-minded professionals and business owners to give back to their communities, their nation and the world. Today, this group, now known as Norman Sooner Rotary, along with others who have joined their ranks were celebrating their successes over the years. 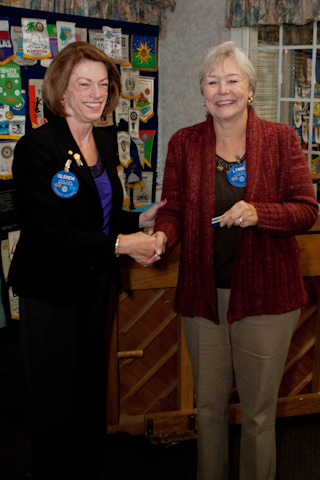 Denise Kueny honored those original members before the club and gave each the microphone to share their thoughts. 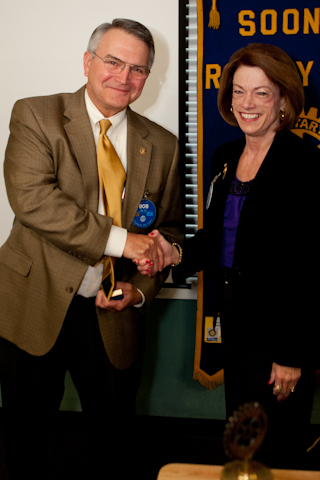 What makes Norman Sooner Rotary so special? Several mentioned the family atmosphere and included personal accounts of the support and encouragement that fellow members had offered during difficult times. Others mentioned the successful projects that had funded or supported life changing programs like RYLA camps, TOUR DE VIN, FOOD AND SHELTER FOR FRIENDS, and Thunderbird Clubhouse. Doug Lyle recounted the club’s history. He shared how the club has continued to offer a wonderful group of people, who work well together, the opportunity to do great things around the world. Many have made friends here in the U.S., as well as, abroad by working in various international projects. Who would have thought that such a small group would have had such a phenomenal impact by providing over $100 million to Polio Plus? Always a step ahead, the club never thought twice about including women. It just seemed the natural thing to do according to Doug. 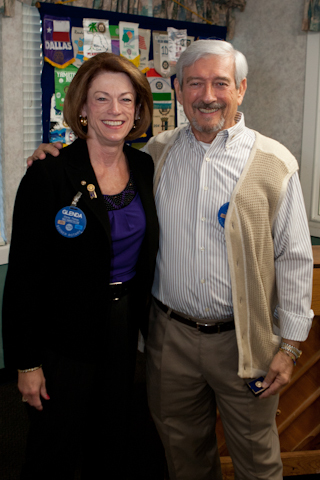 Denise recognized members Andy Paden and Grover Cleveland for their outstanding service to the club. Bob and Ellen Usry were honored for their support of RYLA and other projects that have made a significant contribution to the lives of youth in our community. 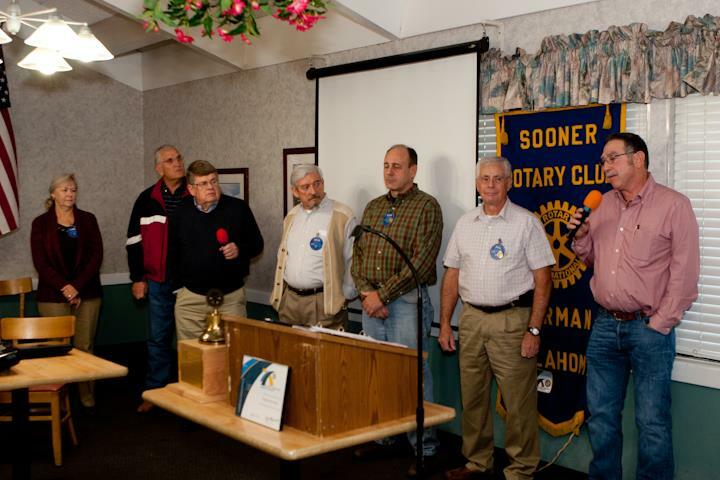 James Harp, as the incoming President of the club, announced several upcoming events to recognize the Silver Anniversary of Sooner Rotary on November 9, 2012 including a banquet. The banquet will provide a venue for historical reflections of the club’s contributions and for visions of future adventures. James also announced that the club’s banner will be updated over the course of the year. Christi Moore led the membership in a discussion of future goals and objectives. Beginning with pointing out what our club does so well, members mentioned the inclusiveness of the group, the welcome feeling that is extended to new members, the support given to one another and continued enthusiasm. Increasing membership, now at 105, to 150 and starting a new club were proposed as future goals. Members volunteered community service activities that could be adopted such as reading to children in the Norman’s public schools. Setting a goal of 100% sustaining membership was proposed, as was growing our international presence. A suggestion was made for members to plan to attend future International Assemblies to be held in Portugal and Australia as Ron Burton, a fellow Normanite, takes the role as President of Rotary International. The celebration concluded with birthday cupcakes distributed to each member as they were leaving. Thanks Denise for making this a special Birthday Bash!! Secret Santa Party is December 2 at 6pm. Held at Crosspointe Church. Ellen Usry will be contacting members with names of children and items requested. Salvation Army Bell Ringing December 1 and 2 at Dillard’s West entrance. Members need to sign up for 1 hour time slots.